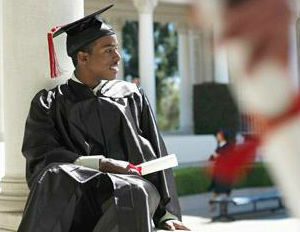 In a 5-part series “Grad School vs. School of Life,â€ BlackEnterprise.com explores the pros and cons of pursuing an advanced degree in lieu of the job market. Job seekers, professionals and career experts weigh in to help you decide whether the decision is a good one in the grand scheme of ultimate career advancement and marketability. If you’re undecided about taking the next step in your education, read below for three good reasons pursuing a master’s degree is worth your while. In many fields, having a post-graduate degree will put you ahead of the pack. From a practical standpoint, the advanced degree can open up vocational doors a bachelor’s degree alone would not necessarily open. Some employers will see your dedication and qualifications and may choose to hire you over an equally qualified but less-educated job seeker. “Because you have an advanced degree, your employer will know that they will have to pay you more money,â€ Dean says. While the initial cost of grad school can be quite expensive, obtaining a master’s degree can give you a jump start into a higher wage. Typically, the starting salary for a person with a master’s degree is at least $10,000 more than for those with undergraduate degrees. Another benefit of pursuing an advanced degree is an expanded base of knowledge, intellect and practical applications. “When you attend grad school, you become an expert in your field and this also makes you more marketable,â€ Dean says. What are other advantages of having a graduate degree? #SoundOff and follow Jamie on Twitter @JayNHarrison.